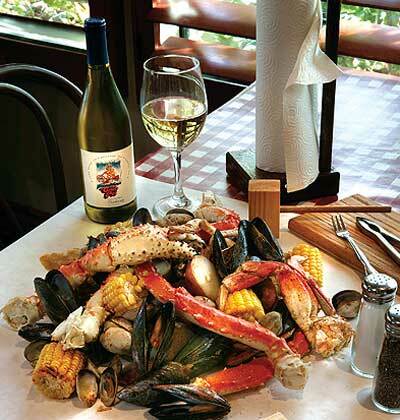 One of the great things about The Crab Pot in Old Town La Quinta is the large family friendly patio for dining. Crab Pot also features a newly remodeled bar area inside with large flat screen TV’s for the sports crowd. On our recent visit Bill and I shared a half BBQ Chicken and a large order of King Crab legs. We seem to hit Crab Pot about once a year. The food is decent but not special enough to warrant frequent visits. That said Crab Pot is a good choice for the kids or large parties as they offer lot of fun finger food. Say hello to Melissa who serves at the bar five nights a week. Melissa is one of the most engaging and customer focused servers in the desert. While we were dining quite a few locals came and went and she addressed each patron by name. Happy hour is Monday – Friday from 4PM to 7PM and includes food and drink specials.